Most kids LOVE Halloween. Costumes, trick-or-treating, candy….I mean really, what’s not to love? Here are 5 fun Halloween themed speech and language activities for you and your family to enjoy! P.S., All of these games are FREE! it one step further and have your child explain the relationship between the scattergory words and Halloween. Which Witch is Which? -Similar to Guess Who, this game is great for language comprehension, question formulation, and turn-taking! There is also a “hint” page to help out little ones! Build a Haunted House -This is a great activity for little ones who like arts and crafts! It’s a fun game that targets auditory memory, following directions and basic concepts. You’ll need scissors, glue, construction paper, and crayons or markers. Spooky Story-Find a spooky picture (kid friendly, of course!) and make up a spooky story together. Make a list of descriptive words related to Halloween and try to use them in your story. For older kids, take turns writing a sentence for the story. For example, you can start with, “It was a dark and scary night,” and your child gets to fill in the next sentence. You can also set up interesting scenarios to further challenge the story writing. For example, “The skeleton walked into the house and he couldn’t believe what he saw!” This is a great way for you to collaborate together! 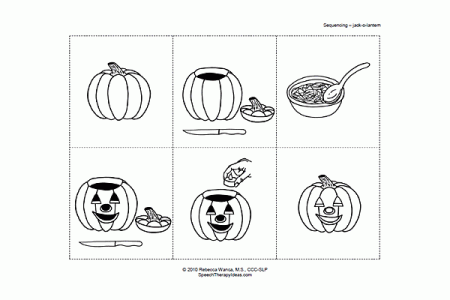 Click here for 5 fun fine motor activities for Halloween!